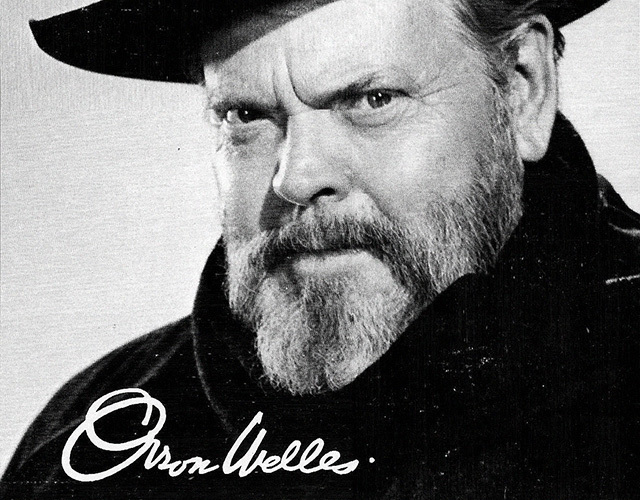 George Orson Welles was born on May 6th, 1915 and died on October 10th, 1985, with a typewriter on his lap. He was writing a new script. A film director, producer, actor, scriptwriter, author of essays, plays, stories and even newspaper columnist, he was a prolific and versatile artist and, above all, a great illusionist with a magic conception of the show, so much different from others. His last appearance was a few days before his death, on the television series Moonlighting (1985-89, Glenn Gordon Caron). The 4th episode of the 2nd season, The Dream Sequence Always Rings Twice, opens with an introduction from Orson Welles. This episode pays tribute to the classic noir films of the 1940s. On the occasion of the celebration of the 100th anniversary of his birth, we want this post to be a small tribute to a magnificent artist, who never ceased to amaze us. I have to admit, in advance, that Orson was not one of my favorite film directors, although I have always admired his work. Moreover, the fact is that, apart from his famous marriage to Rita Hayworth, I did not know any further details about him. I needed, thus, to explore his human side, to approach the man hiding behind the curtains. I immediately felt an enormous fascination for his persona. First if all, I discovered how young Orson's childhood was marked by the divorce of his unconventional parents, whose stormy relationship and early demise influenced him to a great extent. According to all biographies, he was a precocious child and by the age of ten, he was an actor, a poet and an artist. 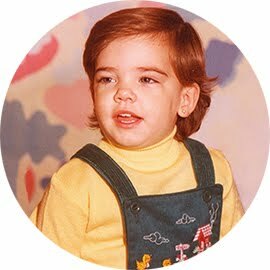 However, not everyone know that at that age, he hadn't yet learned how to add for he had an irrational fear of mathematics that accompanied him throughout his life. My first surprise, though, was the revelation of his profound interest in magic, which he developed in Paris and the great Houdini was the master who initiated him in this art. As Ramón Mayrata explains in his post: "Orson Welles was in favor of secrecy. His constant dedication to the art of theatrical illusion was one of his best kept secrets. The giant-faced boy enjoyed providing false leads. They were part of his magical conception of art, cinema and entertainment that essentially consists in sweeping away the frontiers still blurring the boundaries of reality and illusion." To me, that devotion to illusionism added another dimension, not only to his work but to his own personality. From the moment his tutor had given him his first magic box, illusionism became a permanent facet of his life. Aware the seduction that magic tricks caused to the audience, he often resorted to magic effects in his theatrical or film productions. Ramón Mayrata also reminds us that Welles: "[...] A little over 20 years old, he formed his own company –the Mercury Theatre– and used his experience to adapt magic effects to staging their theatrical productions. Roosevelt government placed at his disposal Elliot's Maxine Theatre in New York, which he viewed as an enlarged magic box. One of his productions was Marlowe's Doctor Faustus in which included levitation in such darkness that players would seem to appear and disappear in that bare and dark performance space." The exceptional director loved to create "illusions" whose "realism" was intended to shock the viewer. He never lost his interest in games and, in return, they became sort of a stable means to make a living. During the years in which he failed to carry through any of its projects onto the big screen, he performed magic tricks in many television shows. 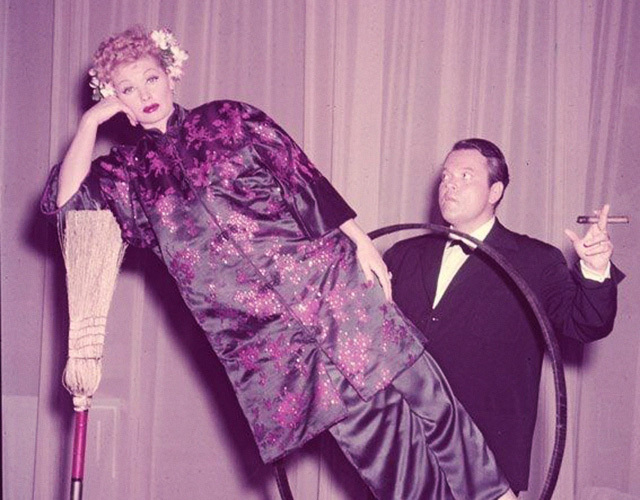 Orson Welles performing his famous "Broomstick Suspension" on Lucille Ball for I Love Lucy (1956). To amaze was his fundamental artistic way of expression. A crying need to raise above mediocrity and to make life an exceptional journey. An invitation to wonder. The story went that, during an interview for television, Orson Welles was asked: "What is the biggest lesson that you can give to young directors?" Welles who obviously enjoyed a good meal, astonished everyone by answering that his biggest lesson would be his recipe for a perfect Bolognese sauce. Orson Welles prided himself on visiting the best restaurants and he particularly enjoyed Spanish cuisine. While in Spain, he would frequently visit the restaurant El mesón de Cándido whose famous owner Cándido often remembers Orson as the guest with the most vigorous appetite that he had ever met. He would eat a whole roasted suckling pig all by himself! As I kept reading on Orson's love for food, I stumbled upon a book called My Lunches with Orson. An entertaining publication of the conversations between him and Henry Jaglom, director, actor and playwright born in London. The book offers a unique, shocking and even bittersweet view around the leading figure of Touch of Evil's (1958) director. Henry Jaglom recorded those conversations recorded over his regular lunches with the creator of Citizen Kane (1941) from 1983 till October 10th 1985, when a sudden heart attack, ultimately interrupted their gatherings. Orson made it a condition that his friend, 23 years younger than him, would keep his recorder hidden. The result: over forty tapes containing his most intimate thoughts and dissertations. Orson Welles and Henry Jaglom would appear together in Someone to Love (1985, Henry Jaglom). That was Welles last film. Jaglom and Peter Biskind, a journalist, cultural critic and film historian, contacted nearly three decades after those meals that took place in Ma Maison, the famous bistrot, owned by Patrick Terrail, located in West Hollywood. The restaurant opened in 1975 in a not-so-glamorous little bungalow, which had previously served as a carpet shop. Despite that fact, it soon became one of Hollywood's most fashionable restaurants. The place doubled as Welles personal office. Interestingly enough, Ma Maison closed approximately one month after the death of its main customer. After Jaglom agreed to transcribe the tapes, Biskind edited the contents into two blocks and 27 chapters. The book includes Welles' comments on different topics, such as Hollywood stars, actors, producers, directors and writers. The wonder that has accompanied me throughout my research on the famous director, turned to stupefaction after reading My lunches with Orson. Many of his remarks have made ​​me smile, while others, believe it or not, left me with my mouth wide open. I will proceed now to give you a small hint of what I am referring to: "I never could stand looking at Bette Davis, so I don't want to see her act." On Woody Allen and Charles Chaplin he shared that "it's that particular combination of arrogance and timidity [that] sets my teeth on edge." 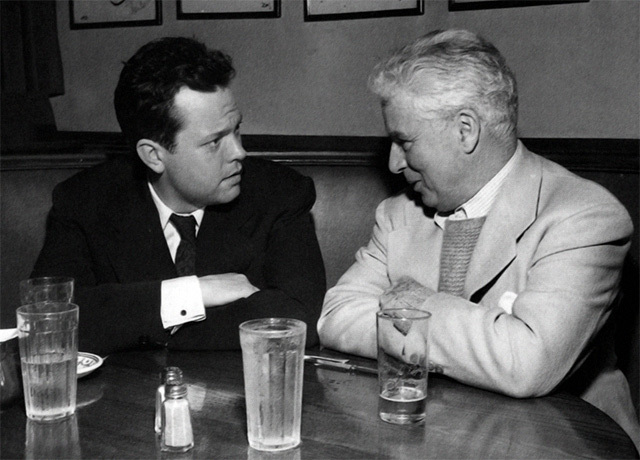 Orson Welles and Charlie Chaplin in a conversation in Hollywood's restaurant Brown Derby (1947). On Citizen Kane he stated that it was really a comedy, not "a fall-in-the-aisles laughing comedy" but "the tragic trappings are parodies. [...]"
On Carole Lombard, he says that "I adored her. She was a very close friend of mine. [...] You know why her plane went down? It was full of big-time American physicists, shot down by the Nazis. She was one of the only civilians on the plane. The plane was filled with bullet holes." He argues that Joseph Cotten was "very good" and adds that "I really loved John Wayne. He had some of the best manners of almost any actor I've ever met in Hollywood." 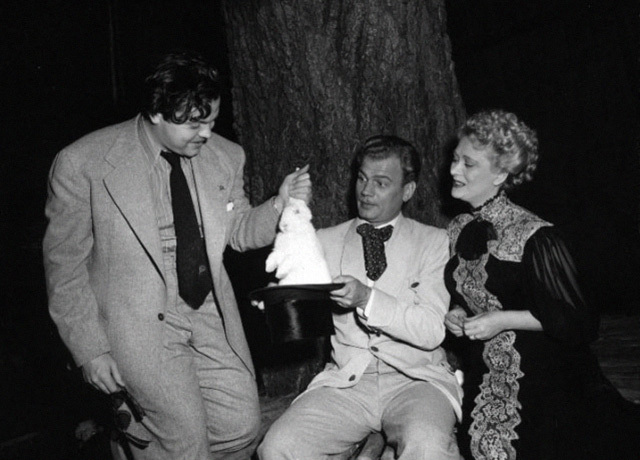 Joseph Cotten and Dolores Costello watch as Orson Welles pulls a rabbit out of Cotten's hat on the set of The Magnificent Ambersons (1942). Absorbed in his commentaries, at first, I was just interested in which would be the next subject or star to be discussed by Welles. However, after a while, despite the fascination exerted on me, I began to notice that the style was perhaps too exaggerated. Just like the pompous gestures of actors in silent films. And suddenly, I dawned upon me. He had initially wanted Jaglom to record him. This talented master of disguise, this great illusionist, this cinema magician, did it again. Far from showing his true personality, he had mirrors placed in front of us, showing a chimera, hiding his secrets. I could even picture him with his child-like face convulsed with laughter. That was, one more trick. It is impossible to get to know –especially if he does not allow it– a man of such intelligence... "Everything about me is a contradiction, and so is everything about everybody else. We are made out of oppositions; we live between two poles. There's a philistine and an aesthete in all of us, and a murderer and a saint. You don't reconcile the poles. You just recognize them." My daughter always tells me that to know is to love. She is so right. Now, on the centenary of his birth and thirty years after his death, this is my personal tribute to the imposing figure of Orson Welles. A singular man, for whom I have a lot of affection. 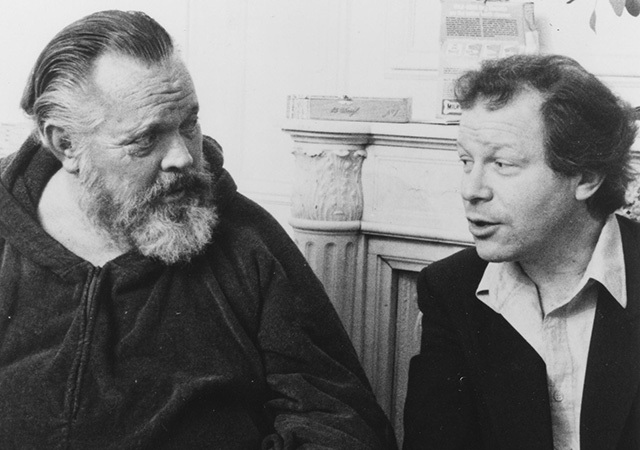 May your magic always be with us, Citizen Welles.